Under ordinary circumstances, a new Aston Martin DB is a big deal, since it represents the flagship nameplate for one of the great Grand Touring marques in the world. This is the 2017 Aston Martin DB11, and its premiere is anything but ordinary. It replaces the DB9, which has been around since 2004, and is only the second new DB to hit the streets in 22 years. Aston Martin has a lot riding on this car. It needs to be Bond-worthy; that 007 will drive it in his next big adventure is a near certainty (the DB10 was a one-off Aston made for SPECTRE, because the 11 wasn't ready yet). The engine is a 600hp, twin-turbo V12 -- AM's first all-new V12 since 1996. That, along with the $211,995 price tag, puts it squarely against the Ferrari California and the like. Say hello to your next poster car... one that, amazingly, is inspired by shoes and insects. How British is that? When you're behind the wheel of the DB11, all you can do is smile. I joined Aston Martin for several days in the hills of Tuscany getting to know the ins and outs of this beautiful machine. A major traffic jam on a highway just outside of Siena, Italy was the perfect place to take in the stunned faces of my fellow motorists, returning the inevitable thumbs-up they shot me with a knowing nod. I felt like Bond. Out of the corner of my eye, I saw a girl scribble the word "bellisimo" on a piece of paper and hold it against the window of her school bus. Grazie mille! Non è la mia macchina. It belongs to Q, obviously. That beautiful shape is inspired by... ants? Yep. When you ask a designer about the inspiration for a product, the answer is often found in nature, and DB11 lead designer Marek Reichman has a thing for insects. No, really -- it has a lot to do with Reichman's obsession with all things arthropodal. He described good design as "insect-like," referencing the precise, natural engineering of ants -- specifically, their ability to carry more than their body weight, and jump and fall without breaking. That hardly means that the DB11 is a Bugeye Sprite; it's beautiful, with an organic look. Its design highlights natural shapes and proportions, showcasing essence over flash. The end result is a stunning car that you can identify as an Aston Martin from a mile away, while still sporting a distinctive and remarkable new design. Brogues are in. You see the classic-but-trendy shoe style everywhere from the trading floor to the red carpet, but rarely has broguing (stylized perforations) been applied to any leather item other than shoes. Nevertheless, Aston Martin gives the DB11 the same type of leather and stitching patterns found on top-quality footwear. 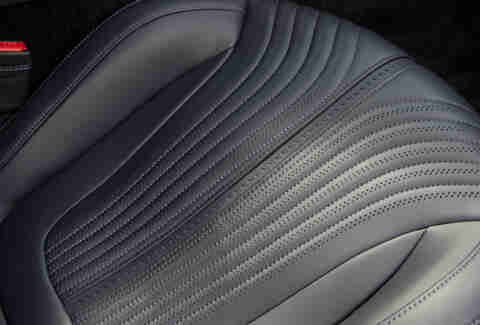 Everything from the leather seat surfaces to the dashboard and center console are covered in the stylish pattern. Will it wear well over the lifetime of the DB11? Undoubtedly so. The effect is slightly over the top, particularly on the leather-covered headliner, but there's no denying the exceptional quality of the leather and stitching. If you're into a more classic leather treatment, Aston Martin happily has something else to offer you, presumably in any color you want. 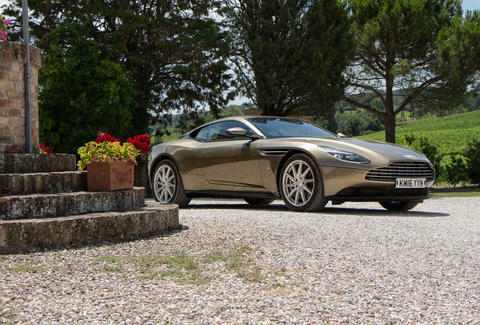 No matter how gorgeous it is to ogle, the DB11 is first and foremost a driver's car. That's why Aston Martin endowed it with a potent, brand-new 600hp, 5.2-liter, twin-turbo V12 -- and it's technically a mid-front-engined car, meaning the front of the engine is behind the center of the front wheels to enable better handling. You could harp all day on the fact that this is a turbocharged Aston Martin (gasp! ), but in practice, the turbos work so seamlessly you don't really notice their existence. Six hundred horsepower is more than enough power to qualify it for supercar status, right up there with the Ferraris and McLarens of the universe. While those exotic beasts are primarily about speed, however, the best part about the DB11 is that you can drive it every day. Step hard on the throttle in Sport mode, and the rear tires will light up. Tread lighter, in "GT" mode, and the DB11 will tiptoe around town. 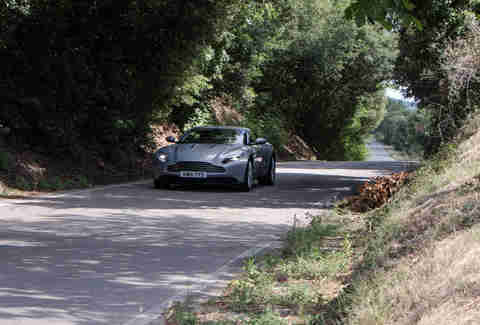 When the roads get twisty and scenic, it holds the road more stiffly and steadily than the outgoing DB9 can, with plenty of room for hooning and letting the rear wheels run a bit wild. The DB11 is a performance machine as much as it is a style leader. Not a bad combination. 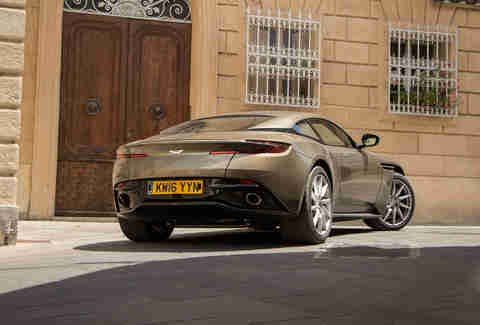 When the DB11 goes on sale shortly, in a run of fewer than 2,000 or so in the first year, it will be the first Aston Martin to ride on a new chassis composed heavily of aluminum and advanced, high-strength steel. It's also the first to feature an excellent navigation system and massively powerful stereo, two touches that bring Aston Martin fully into the 21st century. The company is on a product offensive that will see it attack segments far beyond the performance car; you'll soon be able to buy a Maybach-style Lagonda sedan and a DBX-inspired SUV in either gas or electric guises. It's all very exciting for Aston Martin, which intends to broaden its appeal as a means of maintaining its corporate independence. In other words, if you're a fan of the way this DB11 looks, feels, and sounds, it won't be long before more Aston Martins arrive. You'll have to wait in line to order yours, but it'll be worth it. Just look at the stitching. 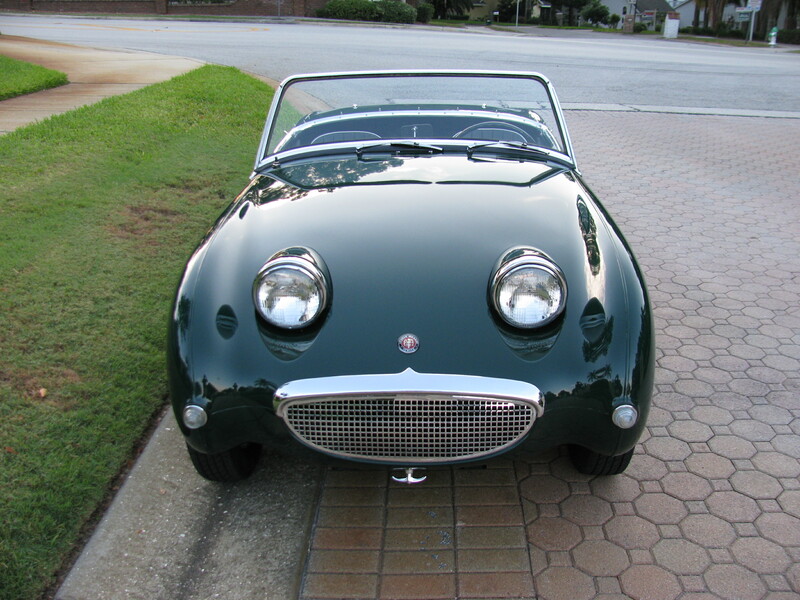 Jeff Jablansky is a contributor to Thrillist Cars. He eats more pasta at home than he does in Italy, and the thought of blood sausage scares him. Follow him @unclewithcars for his opinions on cars, not food.